New Delhi, January 18, 2019: Industrial automation solutions provider OMRON Corporation has introduced industry's first VT-M121, a 2D dimension and visual inspection machine that performs dimension and visual inspection simultaneously to detect scratches and cracks on products. VT-M121 demonstrates feasible full inspection to meet required quality standards of the automotive industry in full cooperation with SIIX Corporation, which is Japan’s largest provider of electronics manufacturing service (EMS) and works to improve the production quality of electronics components to increase their reliability. Instead of the inspection process of the sampling inspection by operators, VT-M121 enables full inspection automatically in the production line and contributes to achieving ‘zero defect’ in automotive electronics which is one of the key requisites to maintain high quality and reliability. Along with the progress in the development of automotive technology such as ADAS (Advanced Driver Assistance System), self-driving, and EVs (electric vehicles), globally, the installation rates of important electrical safety components have been increasing, such as millimeter-wave radar to detect vehicles and pedestrians with wireless connection, electronics mirror mounted as replacement of the current sideview mirror and inside rear view mirror, and LED headlamps. However, these high-density and miniaturised automobile electric components require time to conduct their visual inspection. Therefore, their current inspection process is the sampling inspection in each unit. To improve the quality and reliability of these important safety components, full inspection based on automation is one of the dire needs of the industry. VT-M121 enables detection of defects like or even more precisely than a human eye by using the sophisticated image-processing system ‘FH series’ with illumination pattern of MDMC Light that can flexibly change the illumination colour and the angle. Thanks to ‘NJ damping control’ that integrates the sequence control and motion control, it can also minimise the camera vibration and realise high-speed and high-accuracy inspection. By the simultaneous dimension and visual inspection, the machine reduces the inspection time and improves the dimension and inspection performance with the repeat accuracy 10 µm. 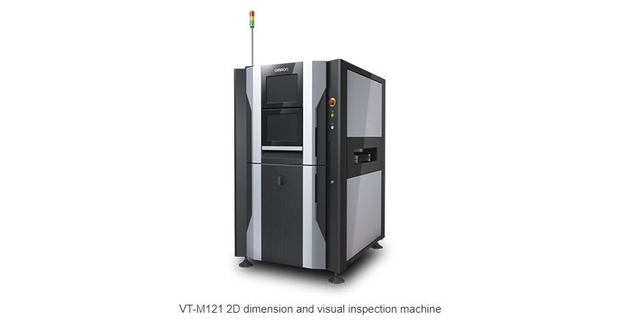 VT-M121 contributes to the safety and reliability of automobile manufacturing by achieving customers' zero defect through full-scale guarantee and accumulation and management of inspection data in place of on-the-spot inspections.